From May 1-31, NWHL teams can re-sign players from their 2016-17 roster and their draft picks during the restricted free agency period, and beginning on June 1 any unsigned players left will be free to sign with any team. The third season of the NWHL will begin in October as the Buffalo Beauts defend their Isobel Cup championship, and with up to 12 players unable to participate in the league this season due to their selection for Team USA’s 2018 Olympic team, this will be the most competitive season yet. My colleague Dan Rice will keep THW readers up-to-date on New York and Connecticut’s signings throughout the summer, while I post updates on Buffalo and Boston. The Boston Pride have not hesitated in re-signing members of their own familiar pack this offseason. The plot thickens, however, as two faces who were once rivals have been brought into the den. Welcome into the fold defender Kaliya Johnson and forward Janine Weber. These signings not only bolster the Boston lineup, but arguably make them an early favorite for the Isobel Cup. When the 2017-18 NWHL season commences, defender Johnson will no longer be donning the green and white of the Connecticut Whale. One of the few professional hockey players to hail from the state of Arizona, Johnson is not necessarily in unfamiliar confines. Johnson played four years of NCAA hockey for Boston College. In 142 games for the Eagles, Johnson tallied seven goals and 36 assists. At the same time, she picked up 74 PIMs and an enormous plus-118 plus/minus. 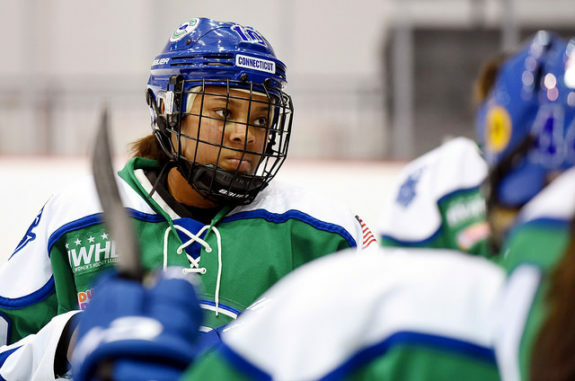 Kaliya Johnson signs with @TheBostonPride after one season with the @CTWhale_NWHL. Internationally, Johnson was a silver medalist at the 2012 IIHF Women’s U18 World Championships in the Czech Republic. She registered six shots on goal and was a plus-6 throughout the tournament, which also featured current and former NWHL players such as Miye D’Oench, Alex Carpenter, Dana Trivigno, Haley Skarupa, and Lyudmila Belyakova. The Pride made an even bigger splash by signing Weber. One of the few Europeans to have played in the NWHL, Weber is presently sixth overall in all-time scoring for the league with 31 points (13 goals, 18 assists) in 35 career games. The Austrian-born forward has spent the past two seasons with the New York Riveters. Weber is now yet another Boston Pride player who has a Clarkson Cup-winning pedigree from her time spent with the Boston Blades of the CWHL, helping to capture the trophy with new teammates Jordan Smelker and Jillian Dempsey during the 2014-15 season. While she scored three goals and four assists in 17 games that year, Weber increased that production immensely in the playoffs by scoring three goals in three games, including the game-winner in the Final, making her the firstEuropean-born player to score a Clarkson Cup winning goal. Between Weber’s ability to put the puck in the net and Johnson’s stinginess on the back end, the Pride have furthered their resources at both ends of the ice in tremendous fashion. Not necessarily expecting the influx of former rivals, particularly ones of Weber’s and Johnson’s character and skill level, the Pride have seemingly pulled a bit further ahead from the other three teams. It will be especially interesting to see how Weber produces offensively from the get-go, and if Johnson can imbue her fashion for shutting down the opposition.